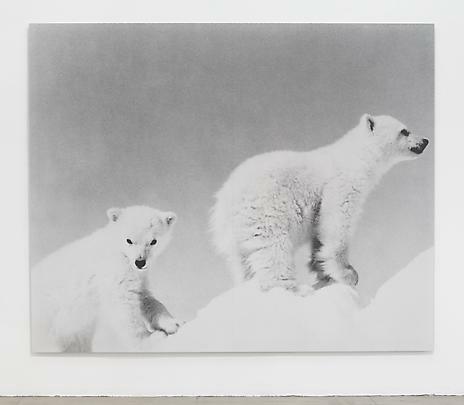 Marian Goodman Gallery is very pleased to announce a special exhibition of early installation works by John Baldessari for our summer exhibition. The show will open on Thursday, June 27th and will run through August 23rd, 2013. 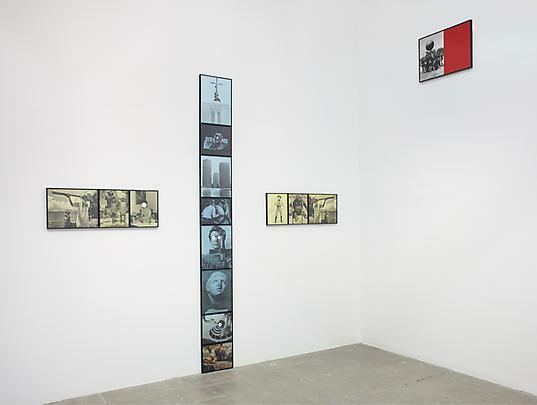 Created between 1987-1989, the composite photo works selected for this exhibition represent a key moment in Baldessari’s practice in which he introduced an architectural element to the work, expanding his strategic juxtaposition of overlapping fragments and chance correspondences to the creation and installation of work into a larger environment. 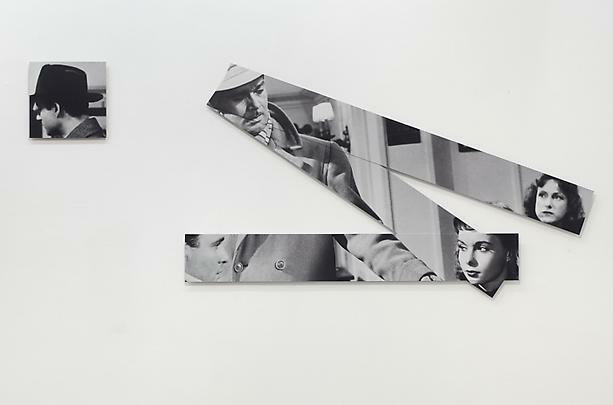 Each of these works were shown at important and distinct exhibitions that were themselves defining moments spanning Baldessari’s oeuvre and artistic career. 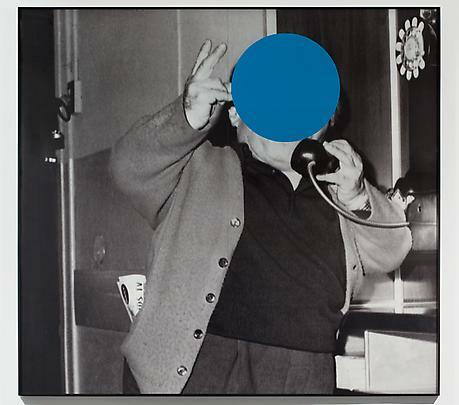 Exploring correspondences and disparities of image and culture as well as the hierarchy of man in these artworks, Baldessari emphasizes the distinct separateness of each photographic image and the composition of a work from incongruous and disparate fragments in space. 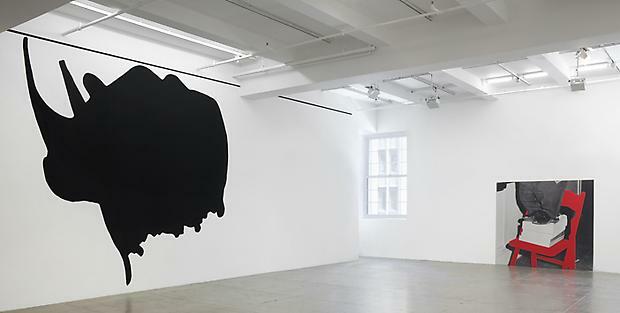 “So much of our thinking is shaped by certain givens”, explains Baldessari. “It is no accident that camera viewfinders are rectangles and that certain proportions shape our image of the world. I strongly believe that there is such a thing as hierarchy of vision that dominates the way that we picture reality. That is why for years my work has fought against what I term ‘the tyranny of the square.’ … ‘The use of frames as architecture is but an extension of the way I build my images up from psychologically charged material.’ (Baldessari in an article in Another Magazine by Mark Sanders, Autumn/Winter 2003). 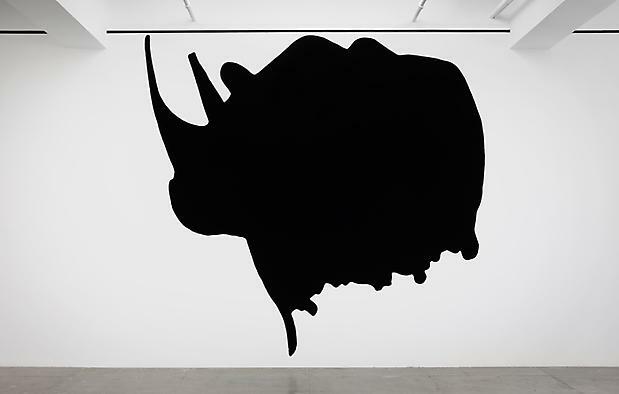 The installation Dwarf and Rhinoceros (with Large Black Shape), 1989 in the North Gallery shows three figures treated different ways: two dwarfs and one rhinoceros. 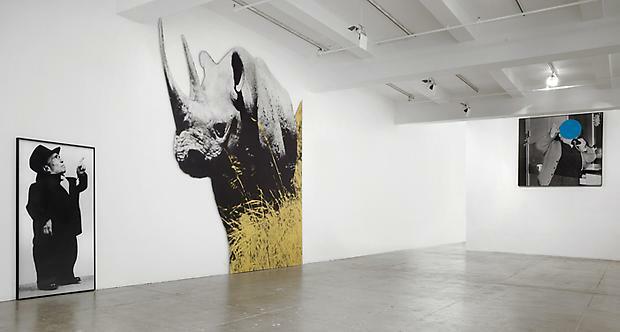 The work was exhibited in the context of an exhibition devoted to the cultural memory of Spain, titled Ni por Esas/ Not Even So: John Baldessari shown at the Museo Nacional Centro de Arte Reina Sofia, Madrid, 1989. Writing in the catalogue, editors Guadalupe Echevarria and Vicente Todoli refer to this work: “One of the dwarves extends his index finger in a gesture reminiscent of Amosdeus, in Goya’s Black Paintings “Quinta del Sordo. Asmodeus was seen as the demon of lust and anger, and like Mephistopheles, had secret abilities to discover hidden treasures and the power to become invisible. In his gesture (the Horned Hand), lay his power to control or hypnotize others…”. The installation was also presented at CAPC, Bordeaux and IVAM, Valencia. 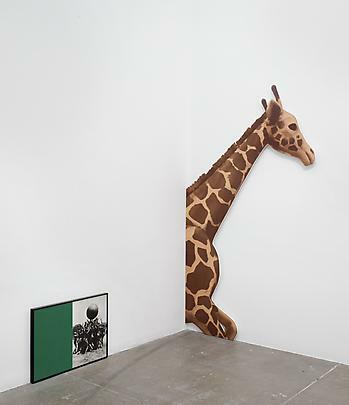 Two Stories (Yellow and Blue) and Commentary (with Giraffe), 1989, in the North Gallery Viewing Room is an installation of multiple components extending over three contiguous walls. 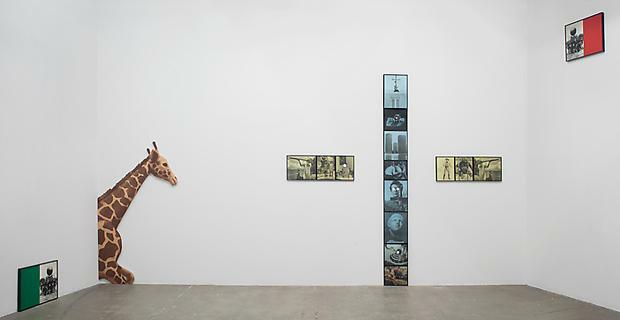 The work’s central element is a column juxtaposing cinematographic references--an antecedent to later stack pieces--and is bordered on either side by photographic triptychs. 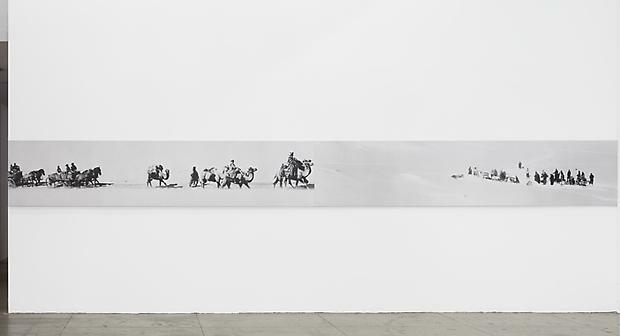 An animal protrudes and wanders in from the periphery of the space, echoing the two photo images of the game of push-ball from Andre Gide’s Voyage au Congo of 1929. 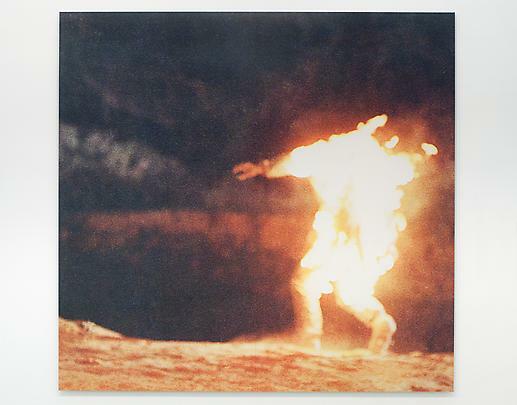 This work was shown in 1989 in the ground breaking Magiciens de la Terre exhibition at Centre Georges Pompidou and Grande Halle La Villette, Paris. 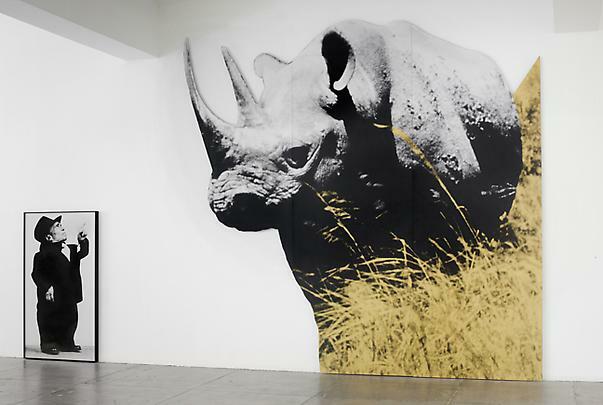 The Difference Between Fête and Fate, 1987 was first created as a special installation for the exhibition John Baldessari at Museo d'Arte Contemporanea, Castello di Rivoli. Rivoli, Italy, May - June 1987. 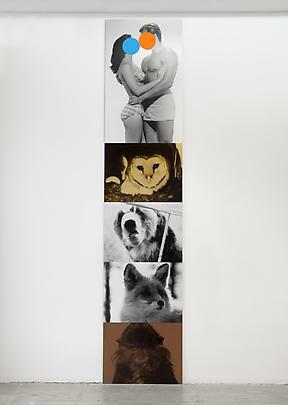 It has been reconfigured as a multi-wall installation in the South Gallery, and is comprised of several groups of black and white photographs of animals and man. 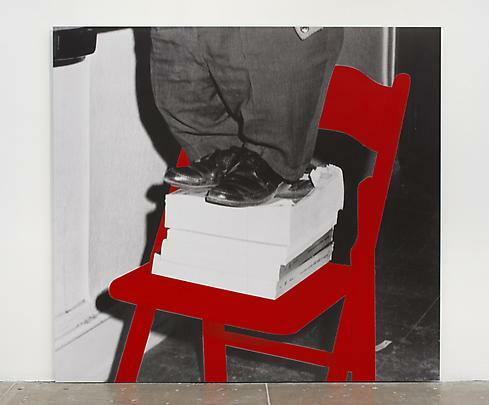 This fall, the second volume of John Baldessari: Catalogue Raisonné, covering the years 1975- 1986 will be published by Yale University Press. Volume 1 which was released in May 2012 covered the years 1956 to 1974. The artist will have a solo exhibition at The Garage CCC, Moscow, Russia from late September thru the end of November, 2013. Please join us at the opening reception on Thursday, June 27th, from 6-8 pm.